There can be many barriers to people accessing the right care, in the right place and at the right time and this is something which Alice House Hospice have been trying to break down during the Hospice UK campaign “Open up Hospice Care” which is running throughout the month of March. “I was diagnosed with a condition known as Motor Neurone Disease on the 29th August 2016 following a visit to the doctor due to feeling ‘weary’ for a period of time. I didn’t realise MND is a very complex disease and can affect everyone differently. It could affect how I walk, talk, eat, drink and breathe and it could even make changes to my thinking and behaviour. My symptoms could also progress at varying speeds, which makes every person’s course of the disease difficult to predict. It is a relatively rare disease so it is important for me to seek out specialists who have appropriate experience but for me our nearest local MND services are based at James Cook University Hospital which is quite a distance away. “I came back the next week but only stayed for an hour, I said I might pop in again next week, but it was unlikely. In fact, it was 3 weeks before I went back. 2 Nurse Practitioners, Helen and Lindsey kept in touch with me and eventually, I agreed to return to Day Hospice in May. Previously my MND has been progressing slowly and steadily since my diagnosis but now it felt like things were picking up pace. I was adamant though that Daisy should come with and so Helen completed a risk assessment and Daisy and I joined the team! My physical condition deteriorated – my mobility decreased, my swallow was not effective, and I was receiving all of my nutrition via a PEG tube into my stomach plus I had problems with my medications and sore mouth. I was very well supported at home by my GP, District Nurse, MND Team and my cousin John and Daisy I was struggling more and more with daily living. 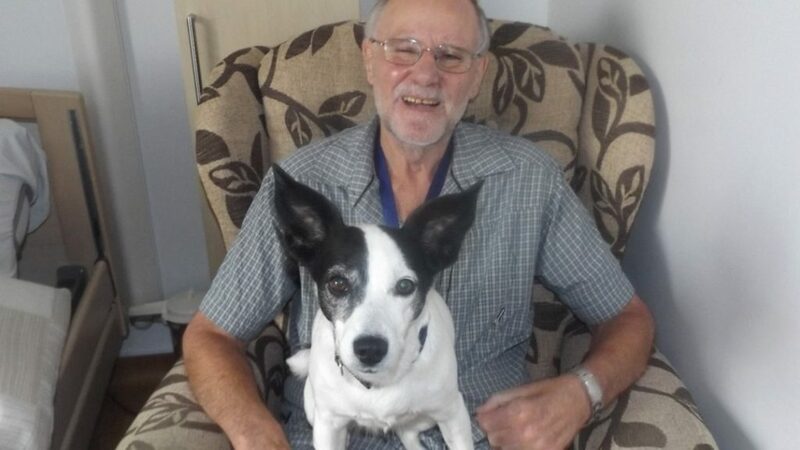 All the while I continued to come to the weekly Day Hospice with Daisy and each week Helen or Lindsey spent time with me and dealt with any issues as they arose such as prescribing which had always been done by my doctor before and they spoke with the MND team at James Cook Hospital. I spent many hours talking with Helen and Lindsey about the future and we had some difficult conversations about planning for what might happen – I tried to be as open as I could because I had very definite wishes and beliefs about my future care. Helen and Lindsey helped me keep my independence and privacy as I came to terms with my MND, and the deterioration of it. They helped me when I could no longer manage my PEG care and liaised with my District Nurses. Ed’s illness progressed more quickly than anyone expected and he was admitted to Alice House Hospice in September 2017 where he was cared for until his death on 1st February 2018. To the very end, Ed retained his dignity, sense of humour and appreciation of life. Daisy lived with Ed’s cousin for a year before being found a family ‘forever home’. Rebecca Jobson, Senior Manager Communications said, “There was no fairy-tale ending to Ed’s story. Our patients don’t make miraculous recoveries and go on to live healthy and pain-free lives. However, our skilled, compassionate, dedicated and determined team do their utmost to make every remaining minute of our patients’ lives as comfortable, dignified, and happy as possible. Helen, Lindsey and the staff of Alice House Hospice would like to thank Ed and his family for allowing us to share his story.